Worth a Seventy-Three Year Wait? Most people believe Lawrence Durrell’s first novel to be The Black Book, published in 1938 by the Obelisk Press in Paris (it was considered obscene by UK publishers, and not published in this country until 1977). In fact, Durrell’s first novel had been published three years earlier by Cassell. It was titled Pied Piper of Lovers. Unfortunately, it sold badly, was savaged in a review in Janus magazine by John Mair, and few copies survived the Blitz. Durrell himself also refused to allow the book to be reprinted – perhaps because it was a little too autobiographical. As a result, copies are very hard to find – in fact, “barely a dozen copies survive in libraries around the world”. But now the Canadian University of Victoria’s ELS Editions has, after 73 years, finally published a new edition of Pied Piper of Lovers. And a very nice edition it is too. There is an excellent introduction by editor James Gifford – from which the above quote about “barely a dozen copies” is taken. The text itself is copiously footnoted – perhaps too copiously in places: I should have thought it unnecessary to point out, for example, that “Portsmouth, England, is a coastal city in Hampshire”, as only the dimmest of readers is going to blithely ignore context and confuse it with the many Portsmouths in the USA. After the text of the novel is an essay, ‘An Unacknowledged Trilogy’, by James A Brigham, which argues that Pied Piper of Lovers, Durrell’s second novel Panic Spring (published in 1937 under the pseudonym Charles Norden), and The Black Book are a thematic trilogy. Pied Piper of Lovers also features a “Works Cited & Selected Bibliography”. 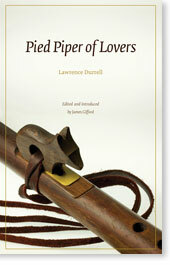 Some books are plainly written by young men, and Pied Piper of Lovers is one of them. The prose seems to foreground the senses, more so than plot or structure or characterisation. Every raindrop is lovingly described, every emotion takes on supreme importance. Durrell’s prose was always lush, but it was in service to the story. In Pied Piper of Lovers, Durrell appeared to be intent primarily on making a point with his novel – in as rich a language as he could manage – and only secondarily in actually constructing a narrative. Perhaps this was because he was at the time chiefly a poet. Clifton Walsh is born in India of an English father and an Indian mother who dies in childbirth. He is raised by his father, a civil engineer, and his aunt, Brenda. His schooling is haphazard, and eventually his father determines he should be sent to school in England. While Clifton is at boarding-school, Brenda settles down in London. When his father dies – Clifton has not been back to India since being sent to England – Clifton leaves school. He has no fixed ambition, just a need to get away. He stays at a sea-side cottage near Hangar, on the border between Devon and Dorset, and meets Ruth. They fall immediately in love. Meanwhile, Clifton has discovered he has a gift for music – specifically, for writing it. He sells a piece to a music publisher, although the publisher is more interested in the “tune” in Clifton’s music and turns it into a piece of popular jazz. Clifton goes to live in Fitzrovia, an area of London, where he meets and interacts with a variety of bohemian types. He stumbles across Ruth, and the two settle down together. She, however, is terminally ill. They move back to the south coast, and he supports them by writing popular tunes. The final chapter of the book is a letter from Clifton to his best friend from boarding-school. It’s perhaps the language of Pied Pipers of Lovers which is most interesting, and most appealing. The prose was clearly written with a poet’s eye. Perhaps it’s not always successful, and there are no passages which grab the eye as there are in Durrell’s later works. Perhaps even, the rich language occasionally works against the story, obscuring what should be clear. Especially in the Prologue, thirteen pages of which describe the arrival of the doctor at the bedside of Clifton’s mother, his birth, and her subsequent death. In other parts of the novel, the narrative seems to enter a literary “bullet-time”, and emotional events which transpire over almost no time are dissected in lush prose over several pages. And yet Durrell’s writing is often at his best when his focus pulls back and he moves the story forward. One of the aspects of The Alexandria Quartet which appeals most to me is that it is a series of novels about British expatriates in the Middle East. Pied Piper of Lovers turns this on its head – Clifton doesn’t feel himself to be English, but he is in England. But neither is he not English. In fact, the major theme of the novel is Clifton’s feelings of being torn between two homelands, yet not fully part of either. Durrell, like Clifton, was born and brought up in India, then sent to England to be educated. Durrell also lived briefly in Fitzrovia, and was as much a “Bohemian” as those he describes in the novel. There is also – and this further indicates to me that Pied Piper of Lovers is a young man’s novel – an uncritical reflection of the attitudes of that set at that time, as if they were adopted unthinkingly. There are a number of anti-semitic comments in the book, a stereotyping of Jews as grasping merchants – a not-uncommon attitude in 1930s Britain, but at odds with Durrell’s later pro-Zionism in The Alexandria Quartet. But there is also an open tolerance of homosexuality – something which seems to me was a peculiarity of the Bohemian set (cf Oscar Wilde, Charles Scott-Moncrieff, Robert Ross, Wilfred Owen and others a decade or two earlier). The book’s structure displays Durrell’s frequent inability to stick to his intended narrative plan. The timescale is uneven, events are not properly placed, and Clifton’s age is occasionally hard to calculate. And yet the book is carefully split into five parts: Prologue (birth), Part I (childhood in India), Part II (boarding school in England), Part III (Fitzrovia), and Epilogue. I’m reminded of The Avignon Quintet, in which each of the five books begins clearly on track but seems to soon drift from it… until the central mystery of the quintet, Templar treasure hidden somewhere in Provence, is solved almost in passing near the end of the fifth book, Quinx. It’s strange that while Durrell showed a poet’s careful control over his language, he never seemed to have as much control over his plots. So, how grateful should we be to ELS Editions for publishing Pied Pier of Lovers? Personally, I’m very glad indeed. I love Durrell’s work and, while I found Pied Piper of Lovers less satisfying than his later works, I’m very glad I read it. I’ll probably even read it again. It’s always interesting seeing how favourite writers develop, and Pied Piper of Lovers is an important novel in that regard. Anyone with an interest in Durrell should read it. Categories: book review, books, lawrence durrell | Permalink.